Chunky Pantone colour swatch books can now be taken anywhere with this handy app. Every designer and creative director dreams of owning the full Pantone swatch book collection. Pantone Studio – a digital version of the iconic colour palette for iOS – means that you can now carry as many hues as you like in your pocket. 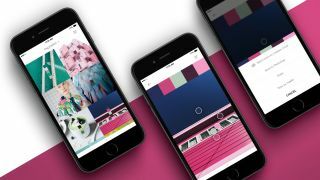 The new app, made in partnership with Rokkan Los Angeles, allows users to explore different colours, create their own palettes, and sample colour in the real world. Those inspired by the shades around them – be it the soft brown of an autumn leaf or the metallic shine of a new car – can now incorporate these colours into their digital workflow. By taking a picture in the app, users can find out where the captured colours sit on the Pantone swatch, and discover their RGB, CMYK and Hex values. These colours can then be stored in a personal library, used to curate colour selections and visual palettes, and tested on graphics or interiors in the app’s ‘studio’. Colours and palettes can also be imported into Creative Cloud, shared with friends on social media or even sent to a client via email. This article originally appeared in Computer Arts magazine issue 258. Buy it here.